The long wait is over. 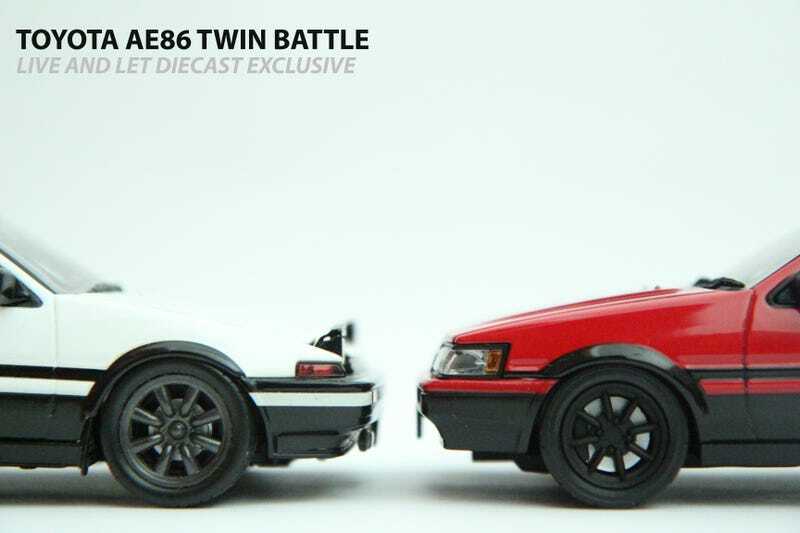 The AE86 battle is finally here, and it will be a fierce one. Both are 1/24, customisable, and deserve a top spot on any car collector's shelf. On the left, a panda white Trueno (Initial D limited edition) by Hotworks Racing, and on the right, a red Levin by Aoshima. This review will consist of two parts - the car itself and the aftermarket parts respectively. Let the battle commence! Aoshima has done a solid job on the Levin. The black panel is correct, down to the yellow trimming and Levin logo. The front bumper is painted in matte black, giving a slightly rougher texture than the red body panels. This is supposedly done so to replicate the unpainted plastic bumpers on the real car. You can also find mountings for the foglights at the bottom, although there are none to be found. The most impressive part are the headlights, which look incredibly realistic with the clear lenses and small details inside. The only drawbacks to be found here are the visible mounting posts on the signal lights, as well as the half-baked grilles. If Aoshima had bothered to do a little touch-up and improve on these areas, the front of this Levin would be perfect. Hotworks' approach is similar. The front of this Trueno is generally well-made. The small Trueno logo sits prominently against a black backdrop. The lensing for the side and front signal lights are in a deep orange, which is quite realistic and pleasant to look at. There are also mounting posts for the foglights, which are provided in the box. The headlights, however, do not fare so well. While they are shaped correctly, I question Hotworks' decision to have the lenses tinted yellow, as it makes the front look horrible and cheap. Things get worse as we move down to the bumper area. As the grilles are much more prominent than on the Levin, the lack of details are even more glaring and obvious. Aoshima has made a decent effort in replicating the AE86 lines. I am a fan of its two-tone colour scheme, and it has been recreated well on this model. The door and window trims have been painted in matte black, with a similar texture to the bumper. The door handles receive the same treatment, whereas the keyhole is painted in silver. There are small Levin badges to be found near the rear wheel arch, which is brings a lot of 80s vibes. They look lovely as well, contrasting with the red background. The brake discs are reflective and seem to have a brushed texture. An unexpected, but pleasant surprise for a 1/24 scale model. It is too bad, then, that they do not rotate with the wheels. Unfortunately, the doors cannot be opened here. Bad point for Aoshima there. Hotworks has also done a good job in modeling the AE86 body. Like its twin, the Trueno has glossy and consistent paint applied onto it. Unlike its twin, however, the black trims are also glossy. There are Trueno logos at the side, and matte black paint is also applied on the window trims. However, they are not done well, which can be seen in the photo above. The black paint is slightly wavy and not straight. The brake discs provided are also smaller than the ones found in the Levin, and they are light grey plastic parts. Not quite as realistic as our Aoshima brother then. Again, Aoshima completely gets it right at the back. The rear zenki (early model) tail lights have been faithfully reproduced, again with multiple lenses. The results are wonderful. Then badges on the bootlid are all present and accounted for, with exact fonts and colours that can be found on the real car. The keyhole is a separate metal piece, which is great. The rear window also has orange-coloured demisters. On the bumper, there is a small hole that recreates the towhook mounting area. The bumper itself is quite fascinating to look at, with its various lines and subtle detailings that you would not expect to see on a small car like this. The exhaust system is visible and quite detailed. However, Aoshima has decided not to install the rear wipers, leaving you to add in it when modifying the car. This is to leave space for the aftermarket rear spoiler if you want that instead, but it certainly reduces the sense of realism that this car has going on. The Trueno looks good as well, at first glance. It has clean lines, correct badges, demisters on the window, and a wiper for it. Mudflaps can be found behind the rear tyres, which is a nice feature. They are absent on the Levin. Sadly for the Trueno, the keyhole is just a tampo. This is not as serious as the tail lights, though. The red elements are pink, and the signal lights are way too light. The outer signal lights seem to be moving inwards, rather than outwards as well. The engine details on the Levin are truly spectacular. Detailed hoses and pipes can be seen clearly. There engine block itself has numerous separately painted parts and badges, significantly enhancing its presence. A strut bar rests across the engine, decked out in an aluminium finish. The 4A-GE letterings sit proudly at the front. This is quite extraordinary, as you can find many 1/18 scale models with engine details not as in-depth than this. The bonnet also opens extremely smoothly. In fact, I expected it to slam shut the moment I let it go, thinking it probably had no resistance. It stayed in its open position though, which is great. The engine inside this Trueno is supposedly the Group A 20v 4A-GE engine, swapped by Bunta Fujiwara in the Initial D anime. It has visible silver ITBs, silver wirings going around the engine block, and a 3-point strut bar across the engine bay. It is a nice block, but nowhere near as detailed as the one found in our Levin review car. To make this a fair review, let us look at the original 16 valve 4A-GE engine that came with the Trueno out of the box. The resistance when opening the bonnet is slightly greater, and do not feel as refined as on the Levin. Comparing this to the engine block on the Levin, this is quite disappointing. The wirings are all casted together, and details are lost in a sea of black plastic. A shame, as this has a lot of potential. This is where the Aoshima product slips behind. The interior is decked out in a three-tone burgundy/brown/red. While the interior is generally well-crafted, the red paint comes across as too glossy. It also leaks into other components like the window winder. The aircon vents are painted together with the rest of the dashboard, again wasting potential. The steering wheel is quite poorly done, with a haphazard paint finish for the metal bits. However, I found the digital cluster to be fantastic, bringing some life to the interior. The interior on the Trueno is far better. The red/burgundy trim is far more subdued and almost matte in finish, complementing the rest of the black interior. The details on the door card are much more precise, such as the handles and window winders. The steering wheel is a beauty, with a finishing that matches high end diecast models easily. The Toyota logo at the lower part of it is also applied well. The gauge cluster is traditional and not digital, though. These aftermarket RS Watanabe wheels have been synonymous with AE86s since the 1980s, and Aoshima has been wise to provide them as aftermarket parts. I quickly installed them onto the car as it improves the looks tenfold. The matte black paint goes well with the wheels, although I would have preferred the spokes to be slightly beefier, like the real ones. The tyres are incredibly realistic, down to the treads and details on the sidewall. The diameters are also just right - not too big, not too small. There are no wordings and tyre information on it, however. Hotworks is once again playing second fiddle. The aftermarket RS Watanabe rims, while having thicker spokes, are way too large in diameter. The gunmetal grey paintwork seems to be overly glossy, as well. The same thing could be said for the tyres. Here are the standard tyre/wheel set for the Levin and Trueno, right to left respectively. The rubber on the Trueno is identical to the aftermarket one - too large, too shiny. However, the wheels themselves are quite well-made and has a cool "T" logo at the centre. The standard tyres for the Levin have a different tread pattern as on the aftermarket ones, which is a small detail that I truly appreciate. They are also smaller and more accurate in diameter, with correctly-sized wheels. Speaking of which, they are 4-spoke and painted gold. An unconventional combination, but then again, many 80s cars had bizarre designs. Black Toyota letterings sit at the centre. The Aoshima AE86 Levin is the clear winner here. While the Trueno has some neat details and pop-up headlights, the Levin provides an excellent overall package that makes it the superior twin. In the next part, we will dive into the aftermarket parts that are given by Aoshima and Hotworks, packaged together with the AE86 products. Stay tuned!